This selection of specialty curtain rods and hardware features ceiling curtain tracks for cubicle curtains and drapery in a variety of styles that includes flexible curtain rods. Also included are magnetic curtain rods, magnetic sash rods and magnetic cafe curtain rods as well as the wider 2 1/2" magnetic dauphine rod. For arched windows there are curved curtain rods and arched curtain rods to accomodate a variety of shapes. 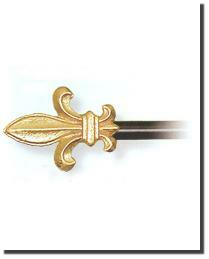 Tapestry rods to help highlight your tapestries are also offered in a variety of styles. For a modern look wire curtain rod systems for hanging your curtains are available in cutting edge designs. Last but not least are panel track as well as swing arm curtain rods also called a crane curtain rod that offer an easy way to swing open your curtains. 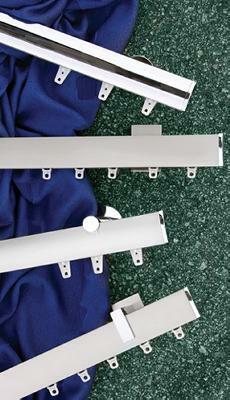 These curtain tracks with hardware are ideal for a wide variety of uses including draperies and cubicle curtains. These curtain tracks are designed for ceiling as well as wall mount and include rigid metal tracks as well as curved and flexible curtain tracks. These curtain tracks are perfect for home use, especially when hanging large heavy draperies and for high ceiling applications. Cubicle curtain tracks that are used in hospitals are offered as well as buttery smooth traversing drapery track used in hotels. 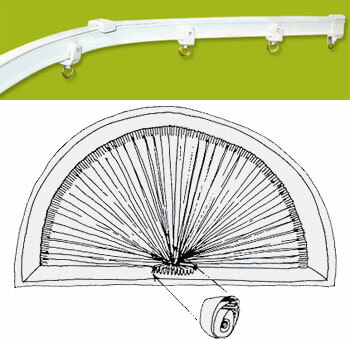 Hardware for installing these curtain tracks is offered for variety of different applications. If you need help selecting the right track for your particular use or are looking for cubicle curtains call our knowledgeable customer service representatives or email us for a quote. Swing Arm Curtain Rods and Crane Rods are Not like most curtain rods that are attached to the wall or window trim on both ends. Not the case with swing arm curtain rods, these unique curtain rods are attached only on one side. When the draperies are closed, they appear like any other rod. But to open them, simply pull back on the rod or the draperies themselves and they swing like a door on a hinge. The rod is screwed into a bracket attached on the wall or window moulding and can open from either the left side or the right. 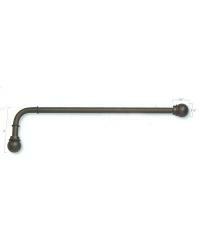 Many people choose swing arm curtain rods in areas where they want to open up the window to let in light or a breeze. Often you will see this type of window hardware used on the bottom half of cafe curtains in a kitchen, but they work well on draperies too. If you were to decoratively line draperies, for example, you could have them closed to display one colour of fabric, but when you swing them open and lay them flat against the wall adjacent to the window, you can display a completely new fabric and dress up the walls as well with swing arm curtain rods. The Tapestry Rods includes decorative tapestry rods with brackets that are designed especially for hanging your tapestries on the wall for display. 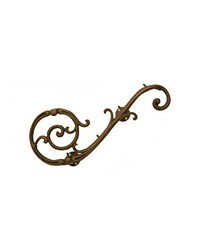 This great selection of tapestry hangers and tapestry rods are all offered to you at discount prices. 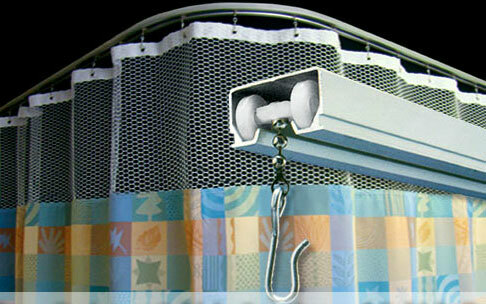 These wire curtain rod systems are the ultimate in light-weight drapery hardware for sheers and other airy fabrics. 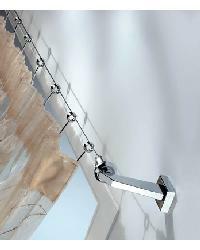 A stainless steel wire tensioned between two decorative wall brackets holds the curtain with ring hooks or ring clips. These wire drapery rods and wire curtain rods for hanging your curtains or draperies have a modern more uncluttered look for todays contemporary styled home. Contemporary hand traversing curtain tracks precision engineered and designed with one way and two way curtain drawing in mind. Great modern style and function unite in these highly useful contemporary curtain tracks and rails along with coordinating hardware. 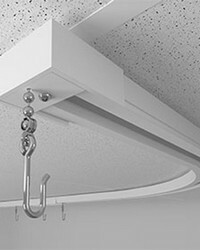 Metal ceiling mounted cubicle track system offers exceptional performance with easy movement. Available in several sizes with custom cutting and bends available. Lightweight decorative window treatment crowns add so much to your window treatments. 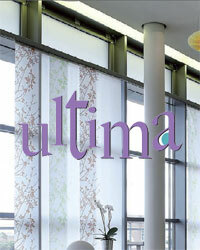 These decorative window treatment scrolls are used to hang stationary window treatments. These window treatment scrolls and crowns are perfect for arched windows and specially shaped windows. Great selection of curtain rods including curtain tracks, magnetic curtain rods, cafe and sash curtain rods, tapestry rods, arched curtain rods, flexible curtain rods, curved curtain rods, wire curtain rod systems, panel tracks and swing arm curtain rods at discount prices.